Google “norovirus” and you’ll probably come across headlines such as New Norovirus Strain Rips Through the US, Norovirus: Why washing your hands isn’t enough, or ‘Super Bug’ Norovirus Invades U.S., Symptoms Appear in 48 Hours. Sounds terrifying. So what’s the deal with the norovirus? It seems like within a few days the norovirus has managed to steal the spotlight from influenza (flu virus). While “norovirus” may sound unfamiliar, most of us have probably gotten sick because of the notorious norovirus. According to the CDC, there are about 20 million norovirus cases each year in the United States. That means about 1 in 15 Americans will get the norovirus this year! The more common names of norovirus illness are “food poisoning” and “stomach flu.” However, not all food poisoning cases are caused by the norovirus. Also, the stomach flu is not related to the flu (influenza). Norovirus causes gastroenteritis, which is inflammation of the stomach and intestines. You can probably guess the symptoms for norovirus illness: diarrhea, throwing up, nausea, and stomach cramping! Ew. Fortunately, most people get better in 1-2 days. Other, less common symptoms may include low-grade fever, chills, headache, muscle aches, and general sense of fatigue. In addition, norovirus can cause dehydration. Symptoms of dehydration include a decrease in urination, a dry mouth and throat, and feeling dizzy when standing up. If infected, make sure to drink plenty of fluids like water and Gatorade. Try to stay with your normal diet as much as possible, but try to avoid foods that are high in fat and sugar. Also avoid spicy foods, alcohol, and coffee for 2 days after all symptoms have disappeared. People with norovirus are contagious from the moment they feel sick until at least 3 days after they recover. If you’re experiencing any of the above symptoms, hide in your room. I’m kidding, but not really. Stay home and get better! Unfortunately, there is no vaccine nor treatment for norovirus. So, what are we supposed to do? Do we stand a chance against this SUPER BUG that has RIPPED THROUGH THE U.S.? Follow these tips from the CDC and hopefully you won’t catch the norovirus (or it won’t catch you!). Wash your hands! I’ve said it before and I’ll keep saying it: Clean Hands Save Lives! Make sure to wash your hands with soap and water after using the bathroom (#1 AND #2) and before eating! Take care in the kitchen! Carefully wash fruits and vegetables, and cook oysters and other shellfish thoroughly before eating them. Check out A Recipe for Safe Cooking! Do not prepare food while infected! People with norovirus illness should not prepare food for others while they have symptoms and for 3 days after they recover from their illness. Clean and disinfect contaminated surfaces! After throwing up or having diarrhea, immediately clean and disinfect contaminated surfaces by using a bleach-based household cleaner as directed on the product label. 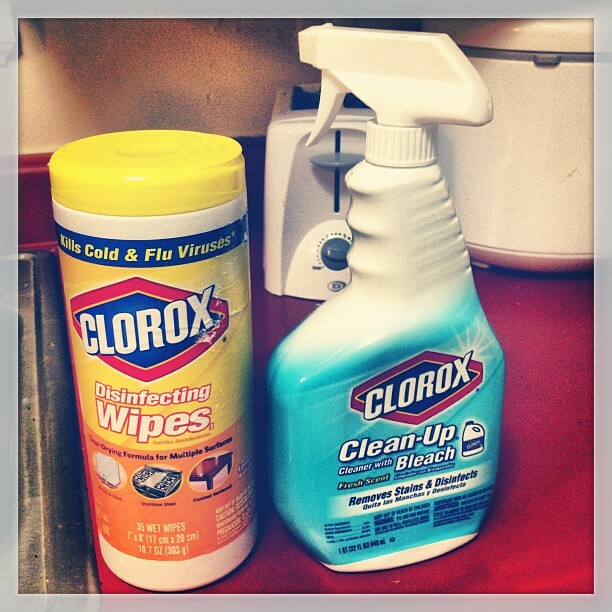 Clorox wipes? Buy them. Use them. Wash laundry thoroughly! Immediately remove and wash clothing or linens that may be contaminated with vomit or stool. Handle soiled items carefully—without agitating them—to avoid spreading virus.